Well, There is a Christian saying. It says, "Prophets died, saints died, great men died - none of them ever returned to life. 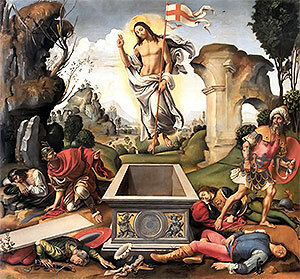 When Christ died some people remembered that he had foretold his resurrection..."
Behind the festive joys, feast, fun and family enjoyment, Easter reminds all of a significant event. The event that Jesus Christ was resurrected, after having suffered and died. It reminds you that Christ, who was crucified on, what is now called, the Good Friday, showed himself up on the Easter. So, it is a time to celebrate. To celebrate - that Lord, who appeared on Earth for the good of mankind, is always with us. That Jesus would resurrect was foretold. The saying came as one of his prophecies. And, with memories sharpened by hatred, his enemies were the first to remember his prophecy. Hardly had he been buried when they approached the Roman Governor Pontius Pilate with a request to guard the tomb. Pilate gave them soldiers and instructed them to secure the tomb. They went, sealed the stone that closed the entrance, and set the guards to keep watch day and night. During the night of Friday, the day of his Crucifixion, through to Saturday, nothing had really happened. So did go the the whole of Saturday, the weekly rest day in Jerusalem then. The things turned different on the early morning of the Sunday, the third day since Jesus was crucified. There was a great uproar and the guards of the tomb were all struck by lightning. for an angel of the Lord descended from heaven and came and rolled back the stone, and sat upon it. His face shining like lightning and his garments white as snow. At this sight, the soldiers trembled with fear and remained as dead men. When they came to their senses there was no point in watching over an empty tomb any longer. They went to report the chief priest about the incident. In reply they were asked to distort the truth. And spread a story that the body of Jesus was stolen by his own disciples when the guards were asleep during the night. Meanwhile, early on the following morning, that was Sunday morning, some holy women started for the tomb. They were surprised to see that the stone had been moved aside. They entered the tomb. And found it empty. As they wondered what all these meant, two angels appeared. The angels told them that Jesus had risen again, as he had already told. Soon Peter, the chief of Jesus' twelve apostles got there along with John, his junior. They found only the linen and the piece of cloth used to wrap his body lied in the empty tomb. Puzzled, they left. But Jesus was yet to appear in front of them. Instead, Jesus went farther. He turned up to join two of his disciples who were journeying from Jerusalem to a village called Emmaus. However, Jesus did not make himself known to them. Jesus to them came to be known as a stranger who had real mastery over the holy Scriptures. Impressed they invited Jesus to stay with them and share their meal. Jesus agreed. But when at the table they recognized Jesus, he disappeared. In no time the two disciples headed for Jerusalem. When they met the apostles and told them about everything happened, Jesus made his appearance. And Jesus convinced them all that he was alive and asked them if anything was there to eat. Then he ate in their presence as a living man does. With this everybody there became overwhelmed with joy that their master had returned to life. And life again had become meaningful to the apostles. Jesus had eaten with them. Talked to them in a familiar manner. And finally he reminded them that he had come from heaven, sent by his Father to perform a task. Now, the task had been done by offering his life for the sins of mankind, it is time for the apostles to follow his suit. And Jesus gave the apostles the Holy Spirit: the power over sin. So one whose sins are forgiven by the apostles, would be forgiven by the heaven. After this Jesus left, as suddenly as he came in. Jesus returned to the same place on the Sunday next, to make believe the unbelievers. And Jesus showed himself now and then to teach his apostles the lessons and to teach them to live without him. Jesus did this for a period of forty days. On the fortieth day of reappearance, when he felt he had given the disciples all that he had to, he went back to the heaven. This same Jesus will come back just the same way He has left. He had left his disciples to carry on his work and to reach his message of love and peace to all.